The Boq'eh-ye Khajeh Rabi mausoleum is a beautiful building with a blue dome surrounded by a park, about 6km north of the centre of Mashhad. 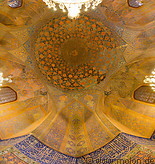 The mausoleum contains the tomb of an apostle of the prophet Mohammad and was completed in 1612. 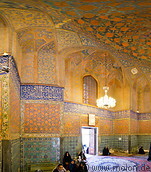 The interior of the building is lavishly decorated with Islamic patterns in golden and blue tones. Around the mausoleum is a large cemetery paved with thousands of tombstones.